A woman’s mind is an unrelenting force once it is set on an objective. But before a woman can reach the “so she did,” she must first begin with “she believed she could.” As president of your community college, I make an effort to encourage everyone – especially women – to reach for their dreams because every dream matters. She believed she could, she built a support system, and so she did. I recently had the honor of meeting Sharonda Hall, a woman from Lorain. 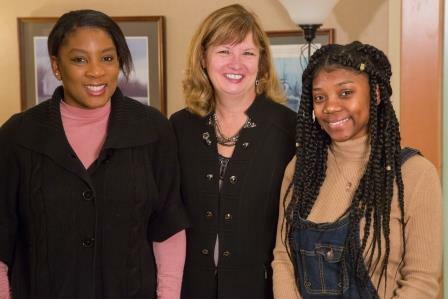 Over the past two years, Sharonda has changed her life – and went from making $12 an hour at factory job to making more than $30 an hour at Columbia Gas and becoming a first-time homeowner. I asked Sharonda what the difference is in her life between two years ago and today. Her answer: Believing in herself. A photo from my meeting with Sharonda and her daughter, Ariana. Like most of us, Sharonda’s life has had many ups and downs. She attended LCCC right after high school in 2001 but left before earning a degree because life happened. She started back several years later, but withdrew due to family obligations. By 2016, she was in her 30s and had two children depending on her. She was earning just above minimum wage at a factory, but her expenses didn’t leave much left over for planning for the future. “It paid the bills but it wasn’t enough to move forward,” she told me about her paychecks. She felt stuck. And, more than anything, she felt alone. When she was younger, she said, she had support from all around her. Once she was an adult with children, that support faded. When a friend sent her information about the WE3 program, she was skeptical. “At first, I didn’t have an open mind. I thought I didn’t have time for this,” she told me. Furthermore, she worried that a decade-old felony on her record would prevent her from finding a better job. The WE3 (Women Empowered, Educated and Employed) program is a United Way community collaborative focused on helping hard-working single moms increase their earning capacity and become economically secure. LCCC is the lead partner in the 12-organization partnership. More than 30 percent of Lorain County families headed by single mothers are living in poverty. The six-week WE3 program seeks to empower these women with the tools to improve their economic condition. At the end of each WE3 reporting period, more than 50 percent of the participants find gainful employment and several enroll in college or vocational training. In 2017, 58 women completed the WE3 program, participating in three cohorts held throughout the year. What Sharonda found when she walked through the doors at WE3 was a community of women ready to lift her up. “The women at WE3 were friendly, welcoming and supportive. Seeing that there are people who want me to be successful, who embrace me and my kids: that experience was like nothing I’d ever felt before,” she said. For those engulfed in generational poverty, believing they are capable of moving up the economic ladder can be a challenging first step. That’s where community organizations make all the difference. It’s my personal belief community colleges and other organizations must meet people where they are; to adjust and adapt to the needs of the students and people they serve. In Sharonda’s case, that meant WE3 meeting in her community, and providing the supports she needed, such as a childcare and job training. The immediate support from WE3, including from Cynthia Andrews, who at the time was the executive director of Oberlin Community Services and is now president and CEO of the Community Foundation of Lorain County, and LaToya Miller, WE3 project coordinator at LCCC, helped Sharonda shift her mindset from feeling stuck to feeling empowered. “Cindy and the others saw in me what I hadn’t seen in myself. They helped me become a positive person,” Sharonda said. WE3 participants undergo job skill preparation and learn to look for jobs that may be outside of their current comfort zones. When the group heard about job openings for field technicians at Columbia Gas, Sharonda was intrigued. She likes working with her hands and finding solutions to problems. The fact that the position came with a company car was an added bonus, she said. The application process was rigorous. Math test. Personality test. Strength test. She made it through the initial rounds and was invited to orientation. She landed the job and began work in April 2017. She’s already had several promotions and said she is far from reaching her maximum potential. At her workplace, Sharonda’s found another support system. “Columbia Gas is a family. They want you to succeed. This is not a job for right now, it’s a career for a lifetime,” she said. WE3 Coordinator LaToya Miller, Sharonda, Ariana and I talked about the importance of women supporting women. Sharonda bought a house last year. Prior to WE3, homeownership hadn’t crossed her mind. 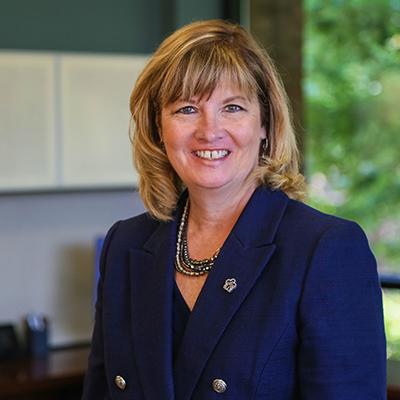 With her career at Columbia Gas, she found herself thinking of buying a home, but she didn’t know where to start. 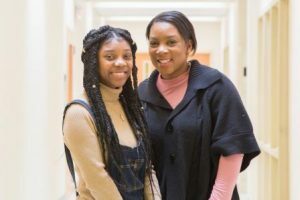 Again, she turned to her mentors at WE3 who guided her in the process. The day I met Sharonda was her daughter Ariana’s 18th birthday. Ariana is a senior in Lorain County Early College High School – a tuition-free, four-year combined high school and college experience located on the LCCC campus. When Ariana graduates in May, she’ll earn her high school diploma and an associate degree at the same time, and I know that Sharonda will be in the front row cheering her on. Ariana will be the first in their family to earn a college degree. She’s been accepted to The Ohio State University and will study international business and accounting. After she crosses the stage at graduation, the family will come home to celebrate. “We will have her graduation party at our home,” Sharonda said with pride. Ariana will graduate from Lorain County Early College High School in May. Now that Sharonda has found success through WE3, LCCC and her employment, she is ready to be a support system for other women. She encourages the single mothers she knows to give WE3 a try – it could be the push they need to start believing in themselves. And once a woman believes in herself, anything is possible. “WE3 means empowering women for success. It means building a sisterhood,” she said. In other words: Sharonda believed she could, she built a support system, and so she did. Are you building a support system? Or are you supporting other women? I want to hear your story! You can find me on Twitter, Instagram or email me at president@lorainccc.edu.